I'VE BEEN SO EXCITED TO TRY THE FEM ROSA COLLECTION. 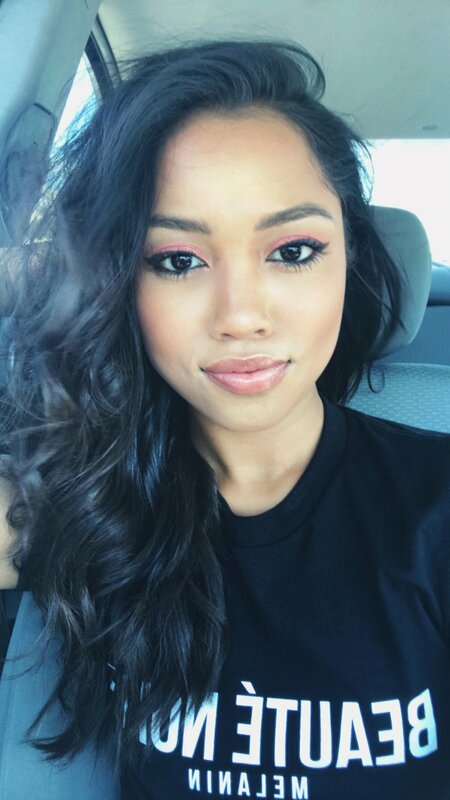 KARRUECHE PUT OUT HER SECOND COLLAB WITH COLOURPOP (WHO BY THE WAY IS HEADING TO SEPHORA!) AND I AM REALLY LOVING THE PALETTE. 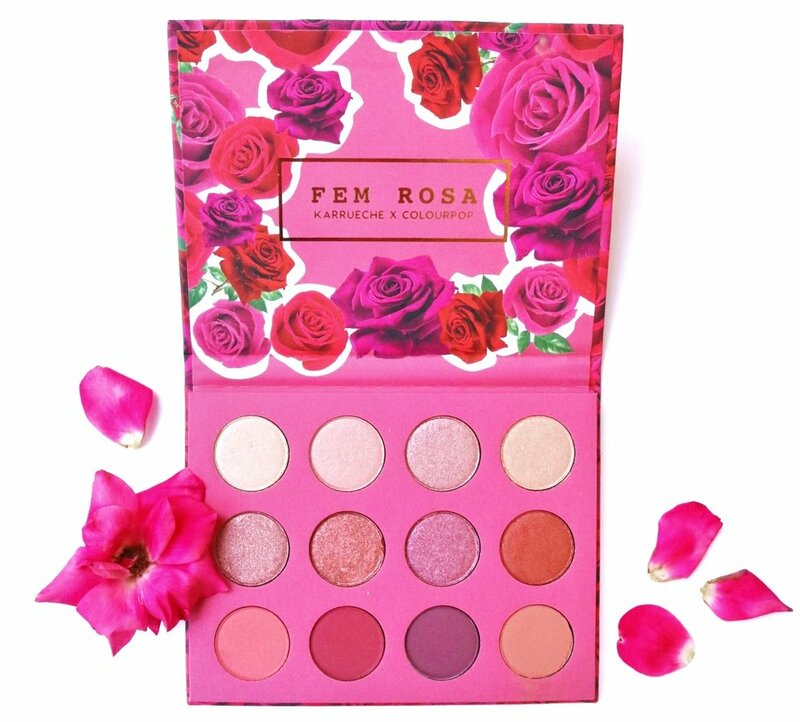 THE FEM ROSA COLLECTION IS A FLORAL, FEMININE, SUPER GIRLIE LOOK WITH LOTS OF BERRY AND PINK HUES. IT'S ALSO REALLY PERFECT FOR THE FALL SO I WANTED TO DO TWO LOOKS USING THE PALETTES. SCROLL TO SEE MORE STYLES AND SWATCHES! WHEN I OPENED THE BOX I INITIALLY SAW NOTHING BUT PINK AND RED ROSES, VERY ROMANTIC. I FEEL LIKE THIS COLLECTION WOULD HAVE BEEN SO FITTING FOR VALENTINE'S DAY! I WANTED TO PHOTOGRAPH THE PRODUCT AND SWATCHES MYSELF SO YOU COULD SEE THE COLORS FOR WHAT THEY ARE. BECAUSE I PURCHASED THE ENTIRE MAKEUP KIT, I ALSO RECEIVED A BONUS LIP GLOSS! I WAS IMPRESSED OVERALL BY THE PAN SIZES OF THE PRESSED POWDER CHEEK PALETTE. WITH THE EYE SHADOWS, AS SOON AS YOU OPEN THE PALETTE, YOU SEE RICH COLORS. IT CAN BE A LITTLE INTIMIDATING FOR SOMEONE WHO DOESN'T LIKE TO DO A PINK EYE. FOUR OF THE COLORS ARE MATTE AND THE OTHER EIGHT ARE SHIMMER. I TEND TO NOT LIKE SO MUCH SHIMMER BECAUSE I USUALLY WORK WITH ONLY ONE OR TWO SHADES BUT I CAN ALSO BE CREATIVE, MAYBE USE THEM AS HIGHLIGHTER. OVERALL, IT'S PRETTY AFFORDABLE ($40) AND THE AVERAGE CONSUMER CAN DEFINITELY USE MOST OF THE COLORS. THE LIP BUNDLE IS VERY VERSATILE, I FEEL LIKE YOU COULD EACH ONE FOR SPRING, SUMMER, AND FALL, THAT'S CONTESSA, MRS, AND DARLING (GOLD, PINK, BERRY). THE KIT GIVES YOU A LOT OF OPTIONS FOR CREATIVITY, AND BELIEVE ME, I TEND TO DO THE SAME LOOK OVER AN OVER. SO IT WAS FUN TESTING HER PRODUCT! THIS WAS MY FAVORITE PART! I HAVE A MEDIUM TO DARK SKIN TONE SO I PHOTOGRAPHED THE SWATCHES OUTSIDE IN THE DAYLIGHT. HOPEFULLY THIS WILL HELP YOU OUT IF YOU DECIDE TO PURCHASE ONE OF THEM. YOU CAN SEE HOW GORGEOUS ALL THE SHIMMERS ARE! 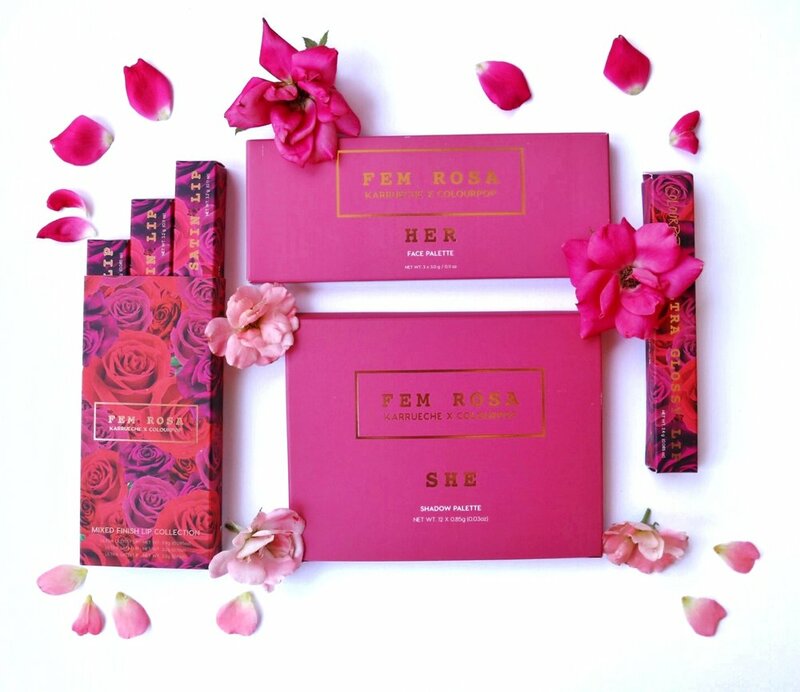 THE COLLECTION IS DIVIDED INTO THREE CATEGORIES: SHE, HER, AND FEM ROSA! I DIDN'T THINK WOULD LIKE THIS COPPER COLORED LIP GLOSS, BUT WHEN I PUT IT ON, IT ALMOST GAVE ME A GOLDEN HIGHLIGHT ON THE LIPS. IT'S STILL GROWING ON ME! I LOVE THAT KARRUECHE PUT COLORS TOGETHER FOR WOMEN OF COLOR. REALLY, ANYONE COULD MAKE THESE SHADES WORK, BUT I WOULD MIX THEM TO CUSTOMIZE A LOOK UNIQUE TO MY OWN SKIN TONE. I TEND TO LIVE IN NUDES BUT THIS IS A REALLY FUN KIT! I GOT THIS SHIRT FROM LEGENDARY ROOTZ. MELANIN QUEENS, GO GET ONE AND LET'S MATCH.